New Every Door Direct Mail Packages! Why should your business use Direct Mail? Direct Mail Works! 3 out of 4 people say they have purchased because of offers they have received in the mail. 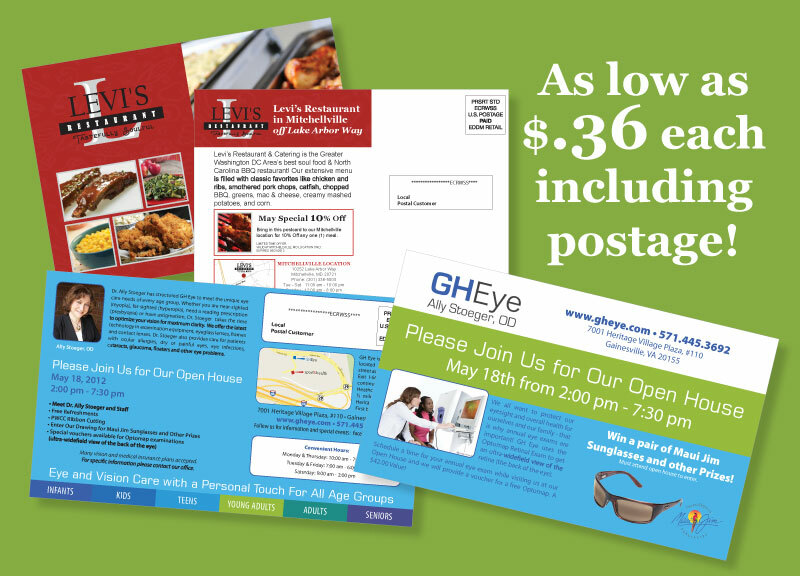 Direct Mail cuts through the clutter and delivers a higher return than most other advertising mediums. Direct mail is also the perfect complement to your print and social media campaigns, lifting returns by up to 60% (data from USPS). Take advantage of Postal rates as low as 16 cents per piece to reach every customer in your neighborhood. According to BizReport 2010, up to 85% of a store’s customers come from within a 5 mile radius. With our EDDM mailing packages you can now reach your target audience with direct mail at a cost which used to be only available to mass mailers. Just pick the neighborhoods you want to communicate with and take advantage of this powerful, low cost way to market to your customers. No Permit Fees, No Mail Lists, Low Minimums. If direct mail was out of reach for you before, it probably isn’t anymore. EDDM allows you to mail to every address within a neighborhood, without buying a mail list, without getting a postal permit, and for as few as 200 pieces, and you still get the low rate of 16 cents postage per mail piece! Retailers and Service Based businesses use EDDM to promote Sales and Events, announce Grand Openings, send Coupons, and publicize special offers. We understand that dealing with the post office can be a hassle even for a small mailing, so at American Solutions for Business we make it very simple for you to begin marketing with direct mail. Our packages are all inclusive. Consultation, Design, Mapping/Route Selection, Printing, Mail Prep, Forms and Post Office submission are included. Promotions in Prince William County! *Note: Your actual cost may vary. Please call us for a no cost, no obligation consultation, following which we will provide a written estimate containing exact specifications and costs. Prices include delivery to any local post office in Prince William County, VA. Limited time offer, subject to change without notice and availability. Offered exclusively from American Solutions for Business’ office in Northern Virginia (www.asb-va.com). Final specifications must meet postal requirements for Every Door Direct Mail.